Meet time: 8:30 a.m. Note earlier meet time! The Lake Mead National Recreation Area offers superb and scenic road cycling just minutes away from the hustle and bustle of metro Las Vegas. Today, we'll explore one corner of that vast area as we descend to the lake and conquer the climb back up through Boulder City. 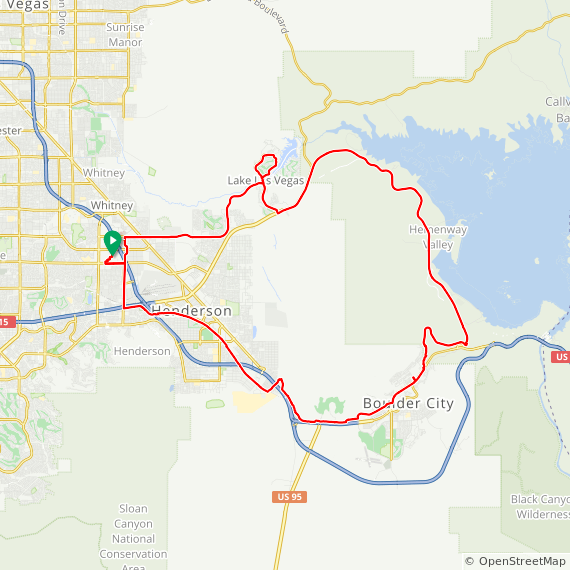 Before we get to Lake Mead, however, we'll start with a special short bonus climb: the loop around Lake Las Vegas and then back up to Lake Mead Parkway. That will get us to our first rest stop of the day at the River Mountains Bike Shop. After that, we'll go down the hill to the Lake Mead entrance gate, where you'll need to either pay a $5 cyclist fee or show a valid entrance pass (such as the nationwide America the Beautiful pass). This is our gateway to Lakeshore Road, 12 miles of rolling hills that trend gradually downward to the lake and provide striking views of the lake and its "bathtub ring." Since we descend to the lake, we also have to climb back up. We'll use the River Mountains Trail, which is a longer but far more gentle climb that the hill on Highway 93 that motorists use. When we reach Boulder City, we'll take another rest stop, and then we'll bypass the steepest part of the trail (the part we did on our last ride) and take a short cut to pick up the trail again on the other side of the city. We'll deal with Railroad Pass again (hoping that the winds aren't as strong this time), and after that it's all downhill back to Henderson. Ride With GPS reports about 2,800 feet of climbing for this ride. Toilets, water, and a Starbucks (of course) are available inside Sunset Station. Park and meet in the east-side parking lot, off Marks Street near the hotel entrance. Follow the signs for "Meeting Rooms," and look for the black truck with ALC goodies.